Clear skies and bright sunlight peeked through a welcome canopy of shade trees--live oak and pine, willow and bamboo, dogwood and pecan--as the road curved ahead. It was a beautiful, autumn day here in Charleston,South Carolina, perfect for a walk down the quiet, little streets of my neighborhood. "Hey, Miss Sylvia," I called. A retired nurse who watches out for everyone, Sylvia is a true matriarch. My Lab Sonny and I pass by her house every day on our walks, and I've grown accustomed to listening for her to be out on her front porch. A distinctive squeak in one of the wheels on her car alerts me whenever she is driving down the street, and I wave at her as she calls to me or honks her horn in greeting. "Hey, baby," came Sylvia's reply. "how you doin'?" "All right. How about you?" "Oh, I'm blessed. My knees is givin' me pain, but I've got to keep goin'." Miss Sylvia's voice always lilts with the authentic Gullah sound of the Lowcountry. "Do you know if the garbage man came yet?" "Well, I haven't heard him, but if you'll wait a minute, I can tell you." I went on to explain my technique of checking the garbage cans by tapping them with my long, white cane to avoid touching them. If the garbage cans consistently echo with a hollow sound, I know that they are empty, that the garbage truck has come. A couple of thumps on a couple of nearby cans provided the answer. "No, ma'am! He has not been by here yet!" "Oh, good! I can get my garbage out! Thank you, baby! You have a blessed one now!" Since 1964, October 15 has been observed in the United States as White Cane Safety Day. In 2016, President Barak Obama proclaimed October 15 as "Blind Americans Equality Day," encouraging all Americans to observe this day with appropriate ceremonies, activities, and programs." The entire month of October is often recognized as "Blindness Awareness Month," "Eye Care Awareness Month" and National Disability Employment Awareness Month. On many occasions, I join ranks with others to raise awareness on behalf of the blindness community. This particular day however, my heart was filled with a sense of dignity, contentment and exhilaration that simply could not be matched by any public display of recognition. Yes, on that beautiful, autumn day, my sighted neighbor looked beyond my physical blindness and saw my ability to help her. In fact, I daresay that Miss Sylvia has become so used to my presence in our neighborhood, she didn't even stop to consider my blindness at all. I could write volumes about my journey through life as an avid cane user: my choice not to use a guide dog; my adopted pet dog with special needs who lopes along beside me every day as I navigate our walks with my cane, the way that I see my extensive, nationwide cane travel experience as something between a dance and a sport, the pride that I feel to be an independent cane traveler and my gratitude to God for His gift of Faith which has allowed me to achieve such personal independence. Today--every day--I celebrate my life as an independent woman who happens to be blind. Today, I honor my walk with God and my long, white cane by just being real, being a neighbor, loving my neighbor and giving thanks for my neighbors--near and far, blind and sighted--who see me as the unique, whole person that God created me to be. Thank God, and thank you, for your ongoing prayers and support. A special thanks also goes to Katie, the Aira agent on the other end of the phone, who assisted me long distance in taking the above picture. Stay tuned for more posts like this one. Until next time, God bless you; and, keep His Song in your heart. Here in South Carolina, hunting season begins rather early, in mid-August. As I was talking with friends about their plans to go deer hunting this year, I couldn't help remembering one of my own adventures in "Deer Country." If you are on the road much at night, you probably know that deer can suddenly appear on the scene, endangering themselves as well as travelers. I grew up in East Central Illinois "deer country", well aware of this reality. In fact, my driver and friend, Carolyn and I were just recently talking about the time the deer hit us as we drove from Illinois into Kentucky. On a lighter note, though, I never could have dreamed that one of these critters would "steal the show" from me in broad daylight. When I was in my mid-teens, I received a call from the program manager of a Central Illinois area resort, asking about my rates and availability to present dinner music on a regular basis. The manager explained that the resort had just purchased a player grand piano. A decision was to be made, whether to hire a house pianist, or simply to use the player piano to entertain guests. When I never received a follow-up call, I was fairly certain of the final decision. About a year later, I was planning my first professional photo shoot at a grand piano. Remembering the contact from the resort, I called to ask if I could schedule a photo shoot there. The manager agreed, and we set a time when the dining area was closed to the public. My photographer and I walked into the establishment and found the piano in the lounge area. 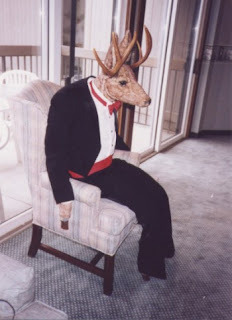 Seated at the grand was "Old Buck", the manmade likeness of a deer, stuffed, life-sized and wearing a tuxedo. A passing employee explained enthusiastically, "Oh, yeah! 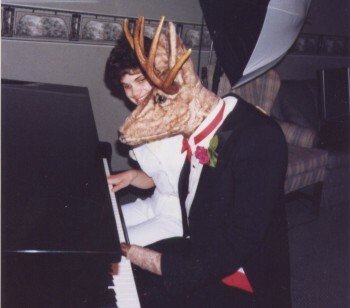 The deer plays the piano. We wire his hooves to the keyboard and put a disk in the player grand. It's really great!" We respectfully placed Old Buck in a chair out of the way, returning him to his seat of honor after the photo shoot. When my photographer left, I asked my mom to take some pictures with her camera. This photo op was just too good to pass up! Old Buck and I talked things over and parted friends. If it meant being a novelty in a smoke-filled lounge, I really do think that he was the best man for the job. As I write, we here in the United States are celebrating Labor Day. I thank God for all who work to keep our country going and growing strong. I am grateful for God's guidance in my own life and work. One of my favorite Scriptures, Ephesians 2:10 reads, "For we are His workmanship, created in Christ Jesus for good works, which God prepared before that we would walk in them." There is no doubt in my mind that He has a sense of humor, and that Divine Humor never ceases to keep me humble. It has often been said that a picture is worth a thousand words. For many of us, , some of the greatest works of art are those drawn from the seemingly infinite reservoir of vocabulary. Throughout my forty-plus years, I have invariably found myself standing in front of some visual wonder next to a sighted person who exclaims in a voice awash with tears, "Oh, if only you could see this!" Many times, I have stifled the urge to offer a snarky remark in return. Trying my best to wrap my irritation in a bundle of enthusiasm, I usually opt for the more appropriate response of, "I can see through your eyes." My effort to console the grief of another over that which is perceived to be my problem is met with mixed reactions: an awkward chuckle, an uneasy silence; an awkward embrace; a pat on the hand or an exclamatory, "God bless you, honey!" Sometimes, my sighted companion will begin describing visual characteristics to me. Whether the description is beneficial to me or not, I keep striving to offer encouragement, "There, now we can see it together!" Recently, I was asked to speak a word of God's blessing for a very dear couple as they celebrated their fiftieth wedding anniversary with family and friends. Our outdoor festivities were interrupted when, literally out of the blue, a surprise thunderstorm sent all of us packing into the kitchen, dining room and living room of our gracious hosts. The house filled with laughter as guests of all ages continued to enjoy a truly memorable evening. The sun was shining again as the party drew to a close. We walked outside and were greeted by a gentle shower of raindrops. 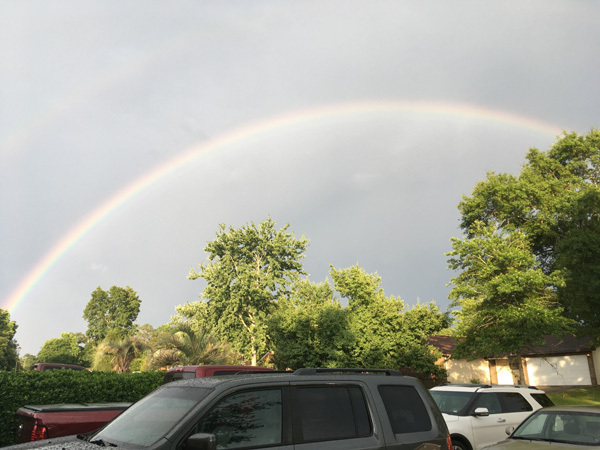 Then, the air was filled with delightful surprise as everyone beheld the most beautiful double rainbow that anyone had seen in a long time. Caught up in the excitement, I knew beyond the shadow of a doubt that I was among friends. I handed off my phone to the person standing next to me and asked her to take a picture. No one asked me why I wanted a picture. No one asked me jokingly if I could see the rainbow, and no one bemoaned the fact that I couldn't see it. Descriptive words flowed effortlessly from those around me, and I was as excited as everyone else. I truly felt included and accepted, just as I am! What is the Kingdom of Heaven like? Well, as I see it, the kingdom of Heaven is like a group of people--blind and sighted, on different walks of life--who gathered one day to celebrate life and love. Together, we reached for a rainbow; and, together we caught it! The lyrics of the song "Vision Through Your Eyes,"* which I penned over twenty years ago, are just as heartfelt for me now as they were back then. I will tell them of the vision through your eyes ... "
As we here in the United States prepare to celebrate yet another Independence Day, I thank God for all of the brave men and women who over the years have given their lives to protect our country's freedom. I am grateful for every God-given opportunity that I have to exercise and nurture my Christian faith, my literacy and my personal independence. With each new day, we who are blind can give praise to our Creator for touch and taste; for sound and scent; for hearts, minds and souls ready to perceive, grow and share a vision that is as unique to us individually as a thumb print. Our fingers glide with speed and accuracy over computer keyboards, touch screens and Braille displays. We work in mainstream application environments guided by the synthetic speech of screen reading software. We navigate our kitchens, homes, neighborhoods, schools, careers and communities. We stand at lighted street crossings, poised with long white canes or dog guide harnesses in hand, attentive to the ebb and flow of traffic and ready to move forward at a moment's notice. Still, on any given day, all of us with our different abilities are met with stumbling blocks, barriers and even brick walls. Preconceived notions, myths and stereotypes abound. When asked, the majority of us who are blind or otherwise differently able will readily say that our greatest obstacles often lie in the propagation of these untruths, many times by people who claim to be our greatest advocates, by folks who "really do mean well." Education is the key to breaking down barriers. Our personal, everyday interactions in our mainstream communities can be changed from negative to positive when we who are blind pause to answer a question posed, or correct an erroneous statement made, by a sighted person regarding our blindness. In addition, we can empower and educate each other, as we share our lists of goals and resources with our brothers and sisters who are also blind. In June, I was called to lead music and ministry for the Friends of Bartimaeus Christian Outreach for the Blind here in Charleston, SC. I was joined by Kimberly, a fellow Dixie Lander and the manager of the "Own Your Life" program at the Association for the Blind and Visually Impaired. Together, we led an informal discussion about resources available to the blindness community. It is always a joy to educate sighted children and youth on blindness-related topics. 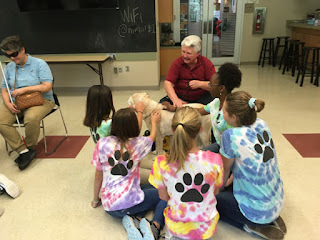 Here, Kimberly and guide Fonzie, Audrey with guide Jessie, and I spoke to "Pet Partners," one of the summer day camp sessions presented by the Charleston Animal Society. These young people, ranging in age from twelve to fifteen years, had a lot of great questions for all of us. While many asked questions about guide dogs, others simply wanted to know our stories, how we learned to read and how we pick out our clothes. Of course, before we all said goodbye, the kids got to meet Fonzie and Jessie and spend a little off-harness time with them. Seeing the difference in the dogs' demeanors in and out of harness gave even the adults a better appreciation of the relationship between blind handlers and their guide dogs. These times of meeting and greeting, tail wags and doggie kisses are always absolutely priceless! In this world, some of us are born blind or become blind later in life. Others among us have sight. These traits shape our lives, sometimes more or less profoundly, but they do not define who we are. There is no "least" or "greatest" and no place for "us and them." The Bible tells us that the first and greatest commandments are that we (1) love God and (2) love our neighbors as ourselves. I believe that when we learn to love God, we learn to see ourselves as God sees us. Through our personal growth in God's infinite wisdom, we can begin to truly love our neighbors as ourselves. Across the hall or around the globe, let us continue to break down barriers and celebrate as we learn more about each other. God's Light keeps shining! Stay tuned for more posts like this one. Until next time, God bless you and keep His Song in your heart! "I just keep looking at your picture of all that snow!" my friend Mary in Illinois exclaimed across the miles as we talked on the phone. "We haven't even gotten that much snow at one time here this year!" I snapped the above picture--complete with human and dog footprints--on the evening of January 3, 2018, just as the snow stopped falling on my front lawn here in Charleston, South Carolina. Our neighborhood boasted around five inches of snow which stayed on for several days thanks to the phenomenon of a "bomb cyclone" making its way up the east coast of the United States. Yes, I prayed for the snow, though not for the layer of ice which came down just before the snow began to fall. Pretty much everything here in Charleston was brought to a frigid halt. The Lowcountry is not used to such extreme winter weather conditions and simply doesn't have the infrastructure in place to deal with them. Roads and schools were closed, businesses shut down and even the mail was on hold for three days! Neighborhood children built snowmen, families rounded up makeshift sleds and took advantage of any slope that they could find. For a little while, to the delight of many especially "yours truly," sunny Charleston became a wintry wonderland. It wasn't long, however, before the snow melted away into memories and life here in the "Lowcountry" went on as usual. In late January, the South Carolina affiliate of GDUI learned that Charleston will be the host city for Top Dog-2019. The Southeast Region Top Dog Workshops are a collaborated effort among Guide Dog Users of Florida, Georgia and Dixie Land Guide Dog Users here in South Carolina. Once again, I am providing administrative and promotional assistance as needed in preparation for this event, where I will also be serving as Emcee and guest musician. In addition, I am collaborating on promotional writing for the 2018 National convention of Guide Dog Users, Inc., as the journey continues with the imaginary antics of those renowned, "rovering reporters, Fred Floppears and Colleen Curleytail." In February, I was called to lead music, devotions and prayers for the Friends of Bartimaeus Christian Outreach Center for the Blind. This outreach is hosted by Calvary Lutheran Church and is one of over fifty of its kind throughout the United States. Friends of Bartimaeus offers a monthly gathering, usually on the last Friday of the month. People who are blind come from all around the Charleston metro area to enjoy a nutritious, delicious hot meal, devotionals, music and fellowship in a safe, non-threatening environment. At the end of each meeting, guests in need are even given a bag of groceries to take home. At the February meeting, we were joined by sighted missionary families from the Midwest representing the Old German Baptist Church. The children are home schooled, and had lots of questions about blindness, Braille, guide dogs, canes, technology and our daily lives as people who are blind. It was a blessed time of food and fellowship, and we all learned a lot from each other. 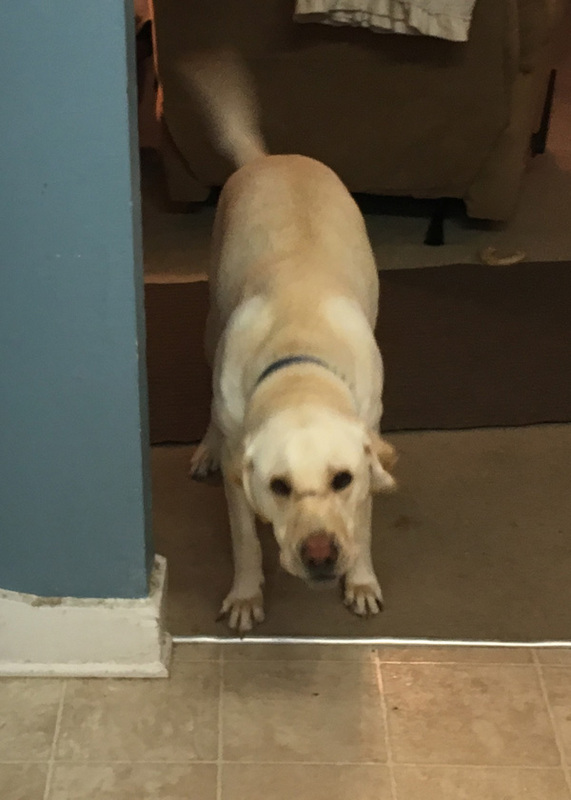 On April 26, we celebrated the fourth birthday of Sonny, that rambunctious, special needs Labrador for whom God has designated me as "service person." I snapped this picture as we played one of our infamous, indoor ball games on his birthday. Every day with Sonny is a gift, and we were so thankful that 2018 proved to be a healthy, happy birthday for him. Earlier this spring, we were contacted by the Oconee County, SC 4H Program. The program's Bark Buddies Club has been studying service dogs and wanted to learn more about guide dogs in particular. Audrey and I made an appearance at the group's May meeting via Skype. It was our first time presenting via Skype, and we look forward to many more presentations like this in the future. God's Light does keep shining! Thanks to your prayers and support, the ministry that He gives me continues to go and grow. Life's path is full of surprises, so please stay tuned for more posts like this one. Until next time, God bless you and keep His Song in your heart! Happy 2018! Our journey into a new year could be likened to the adventure of a lady--who happens to be blind--out in the middle of a rather deep lake (said to be inhabited by alligators) in a paddleboat with a sighted guide who is directionally dyslexic. It is a journey of faith, and yes, that really did happen to me last October as I enjoyed a "Pizza In The Park" outing with my extended family of "Dixie Land Guide Dog Users." 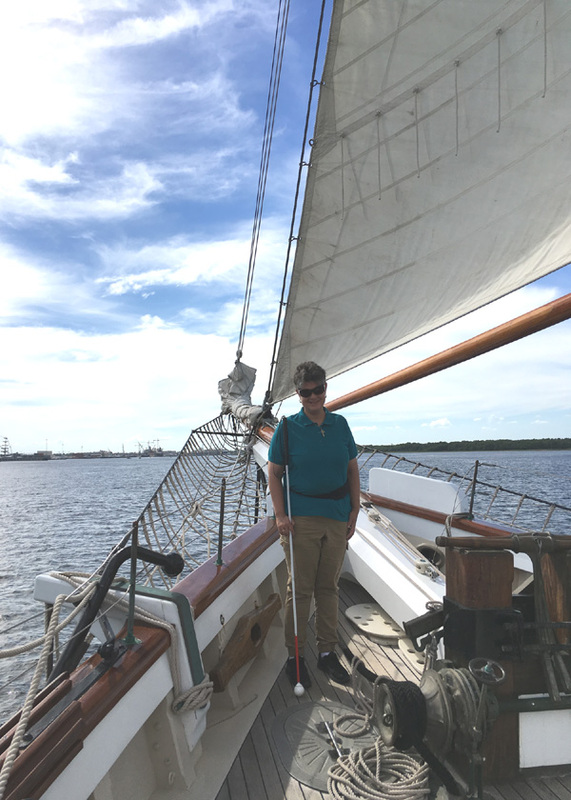 There I was in this boat with Terrie--a sighted guide and friend--who had to close her eyes whenever we needed to turn because she actually is directionally dyslexic. To make things even more interesting, if you want to steer to the right in a paddleboat, you have to turn the rudder to the left and vice versa. So, Terrie closed her eyes to tell me which way to turn, and I turned the rudder while compensating for the reversal of directions. Now, that's what you call a journey of faith, and proof that God really does have a sense of humor! Guess what? We survived the trip just fine, and shared a lot of laughter along the way. This adventure was just one of many 2017 highlights for me. We're well into another year and, if I don't get this published soon, my "New Year's Notes" will turn into Valentines! Before anymore time lapses, here's a look back at my 2017. Guide Dog Users of Florida hosted Top Dog-2017 in Orlando this past January, and I was among the South Carolina affiliate members of Dixie Land Guide Dog Users who provided administrative and promotional assistance as needed in preparation for this event. Just a few short months later, I was collaborating on promotional writing for the National convention of Guide Dog Users, Inc., introducing the imaginary antics of those renowned, "rovering reporters, Fred Floppears and Colleen Curleytail." Although I personally choose not to be a guide dog user, I do have a tremendous respect and empathy for the awesome partnership between blind handlers and their guide dogs. At Top Dog Orlando, Dixie Landers were asked to participate in "The Blessing of the Guides," one of the highlights of Top Dog since that first workshop was held in 2006. While I stayed home to work on a writing project, several of our Dixie Land members and their guides caught the early train to Orlando, FL for the weekend's convention. As our President--my BFF and a dear sister in Christ--Audrey Gunter assisted with "The Blessing," she was reminded of just how much her fellow blind handlers need the opportunity to celebrate the lives of their guide dogs. The majority of guide dog users are on a limited income. When a guide dog retires and it is time for the handler to receive a new dog, most cannot keep their previous guide with them. There is a desperate need for blessing and closure among the worldwide community of guide dog users. Audrey once again shared these concerns with me. I, too, have been praying about this need for quite some time and was inspired to produce an audio church service. The service, titled simply "The Blessing" would speak to the hearts of guide dog users, past, present and future guide dogs, and all who love them. "The Blessing" was delivered to an international audience via the Internet. For those who do not have the Internet, CD copies have been made available upon request. We've received responses from guide dog users throughout the US and Canada, and prayer requests came in from around the globe in remembrance of countless faithful guides who have crossed over "Rainbow Bridge." 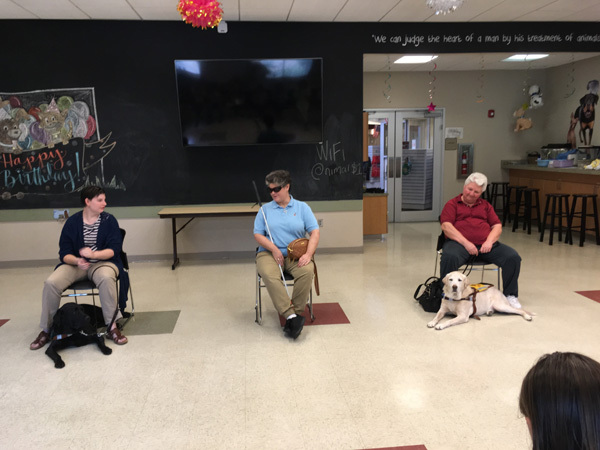 This presentation was highlighted on the Email lists of the national organization, Guide Dog Users, Inc., and was also featured on the Internet radio program, "Spotlight On Assistance Dogs." We have been asked to consider producing "The Blessing" on a regular basis. For a link to "The Blessing" with show notes, Email the Dixie Land Guide Team at dixielandguides@gmail.com with "The Blessing" in the subject line. Another tremendous honor for me in 2017 was being commissioned by the "Heart and Soul" choir in Decatur, IL to write the song "I'm So Glad." Choir members, each having a unique set of challenges, shared with me their ideas for this song, which promotes inclusion among the Body of Christ, the church. In late January, I was called to the hills of North Carolina to provide music for the funeral service of Tommy Shelley, a dear friend of the blindness community and of this ministry. Standing on that mountain in that little church graveyard, closing the service with the singing of The Lord's Prayer, was beyond words an unforgettable experience for me. Our prayers continue for Tommy's wife Ethel and the rest of this dear family. In the spring, I traveled to St. Simon's Island, Georgia, where I served as the main presenter and music leader for the 2017 Spiritual Growth Retreat of the United Methodist Women Charleston District. Here I am pictured with some of my sisters from Grace United Methodist Church who attended the event. My thanks to Retreat Director Angela Pickney-Hall, pictured here with me, and the rest of the Charleston District UMW for making me part of this event. Back in Charleston, another spring highlight was an afternoon cruise on "The Spirit of Carolina," one of several tall ships which came here for a weekend festival. These ships are replicas of those which actually sailed in the 1800's. The festival afforded an opportunity for a blind person to be seen in a venue that is often considered not to be accessible to people with disabilities. I even got to help hoist the sails! 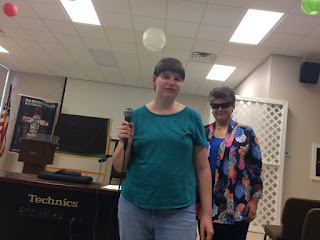 Once again, I was blessed to assist with coordination and participation in presenting for area summer day camps, collaborating with others from the Charleston area's blindness community. Together, we educate sighted children--ages seven thru fifteen--on the subjects of Braille, proper etiquette when meeting a blind person--with or without a service dog--, accessible technology and much more. Most rewarding for me personally is our work with summer day campers at the East Side Community Center. There is always a lot of excitement, and hugs for everyone! We continue to be available to serve as peer mentors for our blind brothers and sisters, and those who are in the process of losing their sight. Sometimes we meet in person, but most of our mentoring takes place via phone or Internet. We consider it an honor and a gift to hear Sofia's confidence growing as she speaks, or to witness Catherine learning to solve many of her own problems. I personally find that I am most often the one who is mentored, and I thank God for every opportunity that He gives me to shine His Light in this way. This past summer, another very special angel in my life entered the gates of her Heavenly home. Millie Kaiser was the person who scheduled my very first professional Christian music engagement back in 1988. The above picture was taken at one of the last church concerts of mine which Millie attended in her hometown of Springfield, IL. 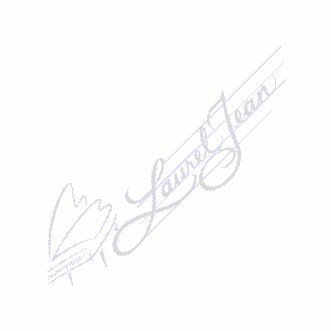 She was the first person to tell me, "Laurel, you have a very special gift and God is going to use you to bless a lot of people." Her words, spoken at the secular community event where Millie and I first met, introduced God's calling of ministry into my heart and began our friendship of nearly 30 years on this earth. Thanks to the Internet, I was able to sign Millie's guestbook and even send some of her favorite music selections for her memorial service, while continuing with the ministry in which she believed so strongly. August, 2017 in Charleston provided one of our nation's best views of the total solar eclipse which, yes, even this blind lady was able to enjoy right in my front yard. August also marked the five-year anniversary of the Friends of Bartimaeus Christian Outreach for the Blind here in Charleston. This outreach is hosted by Calvary Lutheran Church and is one of over fifty of its kind throughout the United States. Friends of Bartimaeus offers a monthly gathering, usually on the last Friday of the month. People who are blind come from all around the Charleston metro area to enjoy a nutritious, delicious hot meal, devotionals, music and fellowship in a safe, non-threatening environment. At the end of each meeting, guests in need are even given a bag of groceries to take home. As one of the founders of this ministry, it is always a blessing for me to assist with music, leadership and prayer support for the people of all ages and their families who are touched by this outreach. Last year, we even assisted with catering the event while our regular sighted cooks were out of the country on a mission trip. In the fall, we here in Charleston battened down the hatches to prepare for three unwelcome visitors. Fortunately for us, Hurricanes Harvey, Irma and Maria had been downgraded to tropical storms by the time they reached Charleston. Most of us (myself included) stayed put and hunkered down in place to wait out the storms. Damage in my immediate neighborhood was minimal and we never lost power, though it flickered occasionally. Others in the greater metro area of Charleston and throughout the state were not so fortunate. The tropical storms were unnerving, with a lot of wind and rain, transformers popping and mature tree limbs snapping as if they were little twigs. Thru it all, we were kept informed by realtime radio/television coverage and alerts from some of the top meteorologists in the nation who happen to live here in Charleston. We haven't forgotten and still pray for those who have suffered such tremendous loss in the paths of these storms. Another highlight of my year was my opportunity to take a course in Internet broadcasting or podcasting with Jonathan Mosen, a renowned broadcaster and podcaster from New Zealand who also happens to be totally blind. The course took place over four weeks via Internet conference and consisted entirely of blind people on all walks of life. I learned so much about the advancements in recording and broadcasting technology accessible to the blindness community and got to interact with a lot of really interesting people. I continue to assist in providing Email technical support for the mailing list of the Not Alone Internet Ministry. This ministry reaches out from St. Louis, MO with a weekly reflection podcast hosted by Pastor Dave Andrus, and a Bible study podcast in which Pastor Dave is joined by co-host Cecilia Lee. Both Pastor Dave and Cecilia are totally blind. These Christian programs offered from a blindness perspective are truly a breath of fresh air, and I enjoy helping out with this ministry. Here is the most recent Christmas display on the gate outside my house here in Charleston. Thanks, Audrey for helping with this! Who says blind folks can't enjoy Christmas lights? 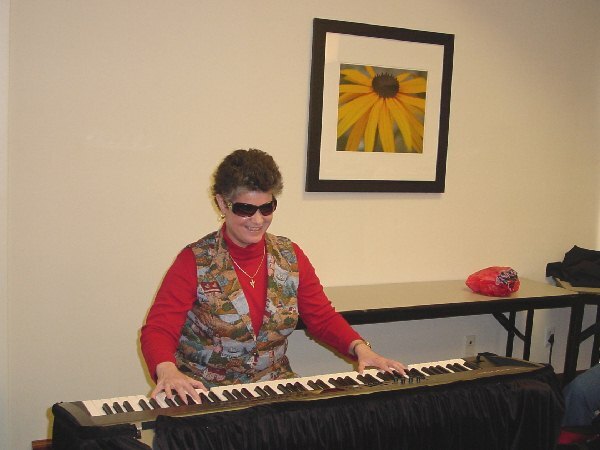 In December, I provided music ministry for the Christmas parties of the Friends of Bartimaeus and also for the Association for the Blind and Visually Impaired of South Carolina. Many guests in attendance, say that these celebrations served as their only means of socializing and celebrating the season with friends. Audrey turned 70 this December and I was truly honored to be the musician and emcee for her birthday party. In lieu of gifts, Audrey asked her friends to bring nonperishable food items to help restock the Friends of Bartimaeus grocery pantry. Thanks to an overwhelming turnout of support, those pantry shelves were completely filled by the truckload of groceries delivered to Calvary Lutheran Church. Every day, we pray that God will put us where He needs us, and use us where He puts us. On Christmas Eve Eve, Sonny and I returned from our morning walk to find a rather large box on our front porch. I brought the box inside and scanned it with an app on my phone which uses the phone's camera to recognize printed text. The box was addressed to someone a couple of blocks away. I suppose that I could've called the shipping carrier and asked them to retrieve the box, but this was most likely someone's Christmas present. I let Sonny rest in his crate, grabbed my cane, tucked the box awkwardly under my arm, programmed the street address into my phone's GPS and walked the package to the home of its rightful owner. As it turned out, the box contained a Christmas gift that a very nice lady named Maureen had purchased for her son. She was elated to have her gift and I was glad that I could help. Sometimes it's nice just to be able to do something that any neighbor should do for another. My heartfelt thanks to all whose prayers and support helped make 2017 a truly blessed and fulfilling year for me, one adventure after the other! Holiday Greetings and Year-End Highlights. Here is a shot of the Christmas lights on the fence outside my home in Charleston, SC. Audrey and I had a great time decorating the fence this year, and I'm sure that it was great fun for the neighbors to watch two blind ladies untangling and stringing Christmas lights! :) We pray that the light of Christ shines in all that we do every day. From beginning to end, 2016 has been packed with God's blessings in my life, music and ministry! Since the January release of my latest album "Living That Story," this collection is now available on CD, as well as on iTunes and other popular download/streaming sites. Recording has changed a lot since I released my first cassette album back in 1993. Now, thanks to accessible computer technology, I can enjoy much more independence in recording and producing an album. With this technology and the Internet, I can work on projects like this in collaboration with people all over the world! God's Light keeps shining in ways that I never would have dreamed to be possible! The weekend of February 14 found me in my home state of Illinois, with musical engagements in the Champaign and Springfield areas. For me, the beautiful snowfall that greeted me while I was there felt like a personal Valentine from the good Lord Himself! Seeing many old friends and meeting new ones made that weekend extra special! Whether presenting in front of a church, or working behind the scenes to help folk feel welcome, wanted and loved in God's House, the subject of "The Church and People With Disabilities" continues to bee a priority. In the spring, Audrey, Jessie and I were called up the road to Goose Creek, SC for an "Able to Serve Sunday" presentation at St. James United Methodist Church. Amid the warm welcome and enthusiastic response from this congregation, we were inspired to meet a young lady named Donna. Having served in Afghanistan, Donna was awaiting a lung transplant. We were deeply moved as Donna looked beyond her own health challenges to pray with us and assist us in our presentation. This year, more talking Bibles have been placed in the hands of people with blindness and other print disabilities, as well as others having mobility issues which make it difficult to hold a book. In the spring, we were contacted by a representative of Project Okurase, an organization based here in Charleston. Project Okurase works with the people of the rural West African village of Okurase in Ghana. We met with Francis, a twelve-year-old boy, blind from birth, who was brought to the United States for the diagnosis of his eye condition since proper evaluation was not available in Ghana. Francis has Leber Congenital Amaurosis (LCA). We were able to refer Francis and his guardian to an independent vision teacher who specializes in orientation and mobility. Francis and his family are Christian, and I found a solar powered talking Bible (The New Testament) in his native tribal language of "Ewe" (pronounced "Ay-way). 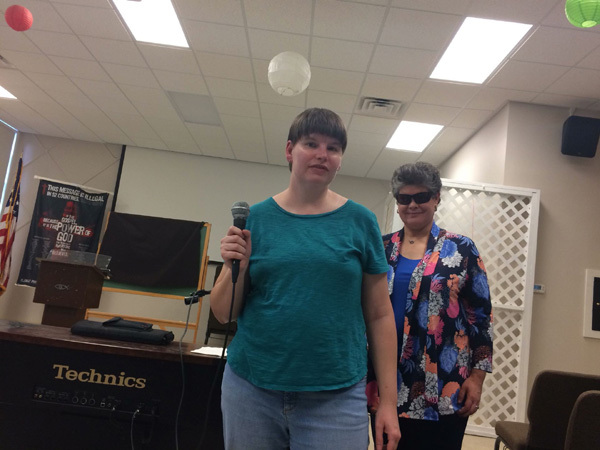 This past summer, I assisted with coordination and participation in presenting for area day camps, collaborating with others from the Charleston area's blindness community. Here I am with friend and fellow Dixie Lander Kimberly and her guide dog "Fonzie." Together, we educated sighted children--ages seven thru fifteen--on the subjects of Braille, proper etiquette when meeting a blind person--with or without a service dog--, accessible technology and much more. We also assisted area Girl Scouts in earning their merit badges relating to disabilities and service animals. Here, Audrey, her guide Jessie and I posed with scouts, their leaders and our puppy raiser friends Mike and Peggy who joined us for this presentation. On July 31st, I truly felt the impact--and was able to serve as a witness--of God's Grace and mercy. I was walking my pet Lab, Sonny, around my neighborhood as I do every day. I approached a driveway with which I am very familiar. A car was idling in the driveway. I stopped for a moment to listen to the car. Then, I continued across the driveway behind the car, just as the driver punched it in reverse. The right rear of the car caught my right hip and I fell. The driver was absolutely beside herself. Her sister had just been taken to the hospital and she confessed that she wasn't even looking as she backed out of the driveway. I was fine, just stiff and sore with a few bruises, scrapes on my knee and hand, and torn jeans. The driver helped me retrieve Sonny, who is soooooo not a guide dog and had occupied himself with some cat food on the porch. Then, she asked me if I needed anything. As I stood talking to this lady, I kept hearing the words "Grace" and "mercy" in my heart. We live in such a litigious society. One can't watch a single program on TV without hearing the advertisement for an attorney to call if one has been in an accident. I gave the driver a hug, asked her sister's name and promised to pray for both of them. Then, after admonishing her to please be more careful, I finished our walk (torn pants and all) and headed home. I was stiff and sore for four days, but never missed a day of walking my dog. By the end of that week, we were back to our regular brisk pace. Praise God! In the fall, we here in Charleston battened down the hatches to prepare for an unwelcome visitor named Hurricane Matthew. While many people evacuated, a lot of us (myself included) stayed put and hunkered down in place to wait out the storm. Damage in my immediate neighborhood was minimal and we lost power for less than 24 hours. Others in the greater metro area of Charleston and throughout the state were not so fortunate. The storm was quite unnerving to say the least. Fierce winds roared thru the night and all the next day. Transformers exploded all around, and mature trees were snapped as if they were little twigs. Thru it all, we were kept informed by realtime radio/television coverage and alerts from some of the top meteorologists in the nation who happen to live and work here in Charleston. It was truly a blessing also to have such a supportive network of friends and neighbors. Those victory shouts of "We made it!" really meant a lot as we all began to venture out of our homes again. Every day, we pray that God will put us where He wants us, and use us where He puts us. Guide Dog Users of Florida will be hosting Top Dog-2017 in Orlando this coming January, and we South Carolina affiliate members have been providing administrative and promotional assistance as needed. Once again, we have been asked to participate in "The Blessing of the Guides," one of the highlights of Top Dog since that first workshop was held in 2006. I have also been providing technical support for the Not Alone Internet Ministry. This ministry reaches out from St. Louis, Missouri to blind people all over the world with an accessible Bible study and weekly devotionals featuring Pastor Dave Andrus and colleague Cecilia Lee, both totally blind. Earlier this year, I was commissioned to write a song for the "Heart and Soul" choir of Central Christian Church in Decatur, Illinois for their annual concert in June, 2017. I am currently working on that project, and preparing for music and ministry in Georgia next spring. We continue to be available to serve as peer mentors for our blind brothers and sisters, and those who are in the process of losing their sight. Most of this mentoring takes place via phone or Internet. We consider it an honor and a gift to hear someone's confidence growing as they speak and to witness them learning to solve many of their own problems. I personally find that I am most often the one who is mentored, and I thank God for every opportunity that He gives me to shine His Light. I also thank God for you. Your prayers and support help keep my ministry and me going and growing in God. Stay tuned for more posts in the coming year. Until next time, God bless you and keep His Song in your heart!